Groups Subscriptions is a subscription framework for Groups. Groups Subscriptions is included with Groups PayPal. Subscription products define terms and pricing. A dedicated subscription menu provides the facilities to define subscriptions. Shortcodes provide a complete checkout experience for subscriptions through PayPal Payments Standard. The settings can be adjusted in Groups > Subscription Settings. The grace period determines how long after payment due a subscription will be allowed to be active until suspended. This is an approximate value and the actual time a subscription will be active in this case may vary. Groups Subscriptions allows to display subscription information on user profile pages (enabled by default but can be turned off). 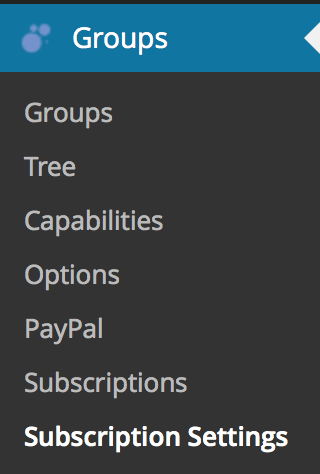 The [groups_subscriptions_table] shortcode allows to display information about a user’s subscription. status : The subscription status, defaults to active. It can be a comma-separated list or *for all subscriptions. Valid values are active, cancelled, completed, expired, inactive, suspended. user_id : Defaults to the current user’s id, accepts user id, email or login to display information about a specific user. show_count : If info about how many subscriptions are listed should be shown. Defaults to "true". count_0 : Message for 0 subscriptions listed. count_1 : Message for 1 subscription listed. count_2 : Message for n subscriptions listed, use %d as placeholder in a customized message. show_table : If the table should be shown. Defaults to "true". columns : Which columns should be included. Defaults to all columns. Specify one or more of subscription_id, processor, reference, status, dates, cycle, description, groups, order.